The small but dedicated craftsman-based boatbuilding company of Frecheville Heaney operates from Paynesville on Victoria's beautiful Gippsland Lakes. 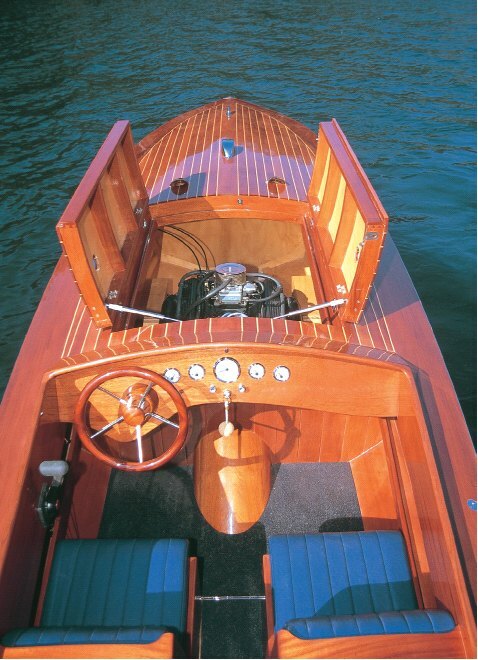 Specialising in building and restoring classic wooden boats, the firm was founded by James Frecheville in 1990 after he returned from sailing to England aboard a 30 foot gaff boat with his wife. Whilst in the UK, James worked in the 300-year-old boat yard of Freebodys on the Thames where he "really learnt about wooden boats - it was a great experience". He started his association with boats much earlier though and was sailing a Mirror dinghy at age eight, and subsequently did a lot of offshore sailing including along the West Australian coast and in Indonesian and PNG waters. When James and his wife returned from England, they moved to Paynesville because they had fond memories of the Gippsland Lakes and "it seemed the place to get a job when we were 'having the recession we had to have' in the 1990s". he inner skins." He elaborated: "Hoop pine is a plantation species that comes from Queensland - it's a stable timber, as rot-proof as you're going to get, and it's the only one that meets the AS 2272 standard. The outer skins are a 7 mm lamination of mahogany. To obtain those, we bought a pack of Brazilian mahogany in various widths which we were able to rip and dress down for 'book-matched' (that is, identical grain-patterned) planks. When you look at the boat stem-on, the sides are a complete mirror image". The engine is a 305 Chev V8 five litre block which develops around 280 hp. James and Tim bought that new as a crate motor and marinised it themselves using after-market parts from Rolco and Tawco. The transmission is a 1:1 Borg Warner FNR box ("so we're gentlemen - we can go backwards"! ), and an 80 litre fuel tank is below the aft deck. Experimentation is continuing with props and a 12 by 16 (diameter by pitch in inches) three-blade is being used at present. A fourblade prop may be tried later, although the present three-blade seems to do a good job with strong acceleration, good handling and no cavitation. As James succinctly summed it up: "You can do all the sums with props, and the prop people can give recommendations, but that's still just a starting point." Top speed is around 40 knots (74 kph) with easy cruising at 30 knots. James said: "We've seen 40 knots on a GPS at 5,000 rpm and it would probably go faster. 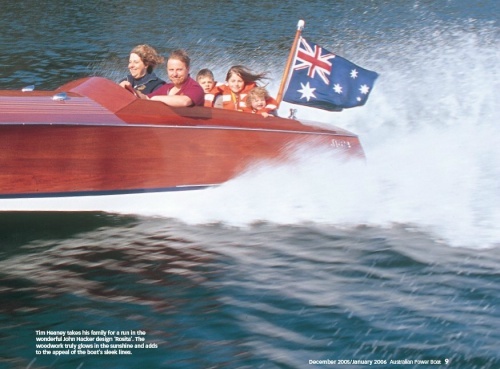 Remember though that the boat was designed in 1924 to have an 80 horsepower motor. We've put 280 horsepower in it, and it jumps out of the water now when I don't think the original would have done." t that stage we were surprised at how stable it was. The chine is carried right out, so there's lots of initial buoyancy". He added: "On a later run we came home at speed across the Gippsland Lakes into a short sharp chop against a 15 knot breeze and some whitecaps. The boat was remarkably dry and smooth. Having a bit of air underneath it helps it run better as on glass water it can tend to porpoise a bit at higher speed." Tim added: "There's not much buoyancy forward and the bow can drop quickly with its fine entry. If you come in behind another boat with a decent wake you can really notice it when you come into the second wave of the wash. You suddenly realise there's not a lot of buoyancy up there." That's true enough and typical of designs from that era, but I was fortunate enough to be granted some time at the wheel and 'Rosita' was a joy to drive. That long foredeck with its simply gorgeous planking seems to reach for the horizon in front of you, and the hull ran and turned with a precision and stability that was far better than I'd expected. The ride too, admittedly in calm waters, was smooth and dry with immediate response to wheel and throttle. The Chev gave plenty of performance, and sounded perfect through twin exhausts set low on the transom. of each crest. I've no doubt that the helmsman needs to be aware of the slender hull and reduced buoyancy in the shoulders (compared with modern hulls), but 'Rosita' sure looks great from every angle. The cockpit is right aft and fairly compact but has two very supportive seats for the skipper and first mate plus a full width rear lounge that keeps two adults or three youngsters comfortable. There's stowage under the seats and the upholstery is padded and trimmed to high standards that perfectly suit the gleaming natural timber finish of the interior. 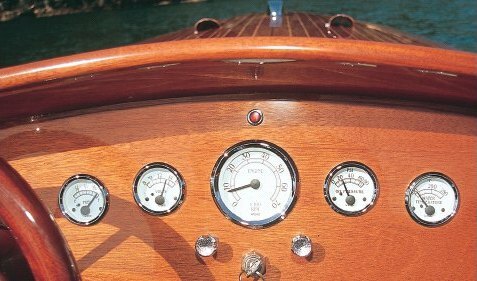 The dash has period-style gauges and a classically- styled wooden wheel with attention to detail everywhere including the dove-tail joinery on the engine hatches that have specially designed and custom-cast concealed hinges. 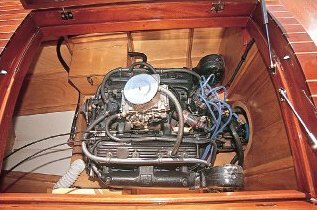 With the hatches open, access to the Chev is easy and its engine bay looks as good as the rest of the boat with the internal wooden structure easily appreciated. 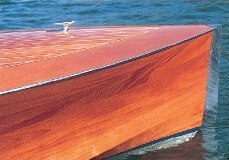 The battery is within its own wooden compartment on the starboard side of the V8, with a matching tool compartment to port. James summed it up: "Our whole crew had input into it. Building the hull we were all go, go, go boatbuilders. But when it came to the fine joinery work at the end, and the planking, it was definitely Tim, we were just helping him. 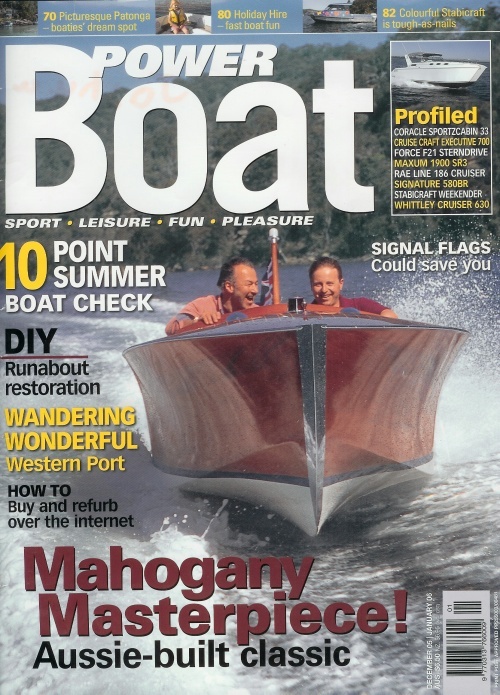 Everyone really liked working on this boat - we've had a lot of fun with it, and we'll continue to have fun with it. 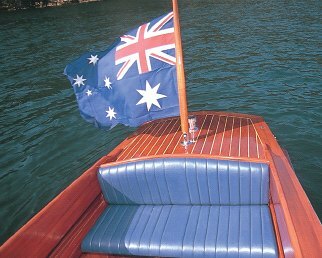 We're going to take it up to Sydney for the next Wooden Boat Festival." I asked the obvious question - if someone wanted to buy it, would it be for sale? James answered: "We would sell it, but the person we sold it to would need to be happy to bring it to boat shows and allow us to do things like our photo shoot today. That's the relationship we like to have with our clients, and it's important. We'd look after maintenance and so on. If someone was interested on that sort of basis, we'd be looking at $110,000 as it stands. A new 'Rosita' would be at least $120,000 depending on power and other details". For the craftsmanship provided by Frecheville Heaney, and for the appealing style that this Hacker classic design offers, that's remarkable value. 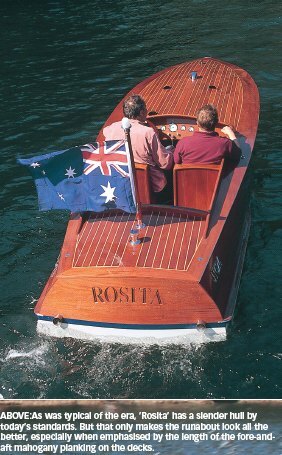 For a wealth of information on wooden projects by James and Tim and their staff, including images of 'Rosita' during construction, visit www.fhboats.com.au, or you can phone (03) 5156 7085.